There are no other countries on earth more cricket-mad than India and Australia, so any series between these two great nations is always a big draw for fans around the world. But if you are in the UK, which has big Indian and Australian ex-pat populations, you may be in for a disappointment if you don’t have a Sky Sports subscription. But don’t worry, if you use a VPN app there are other options available and in this article we will tell you exactly what they are. If you want to watch the Indian tour of Australia without coughing up for the sky-high Sky Sports fees, you will first need to sign up for a VPN. A VPN is an online security and privacy tool which allows users to change their IP Address by redirecting their data through external servers. 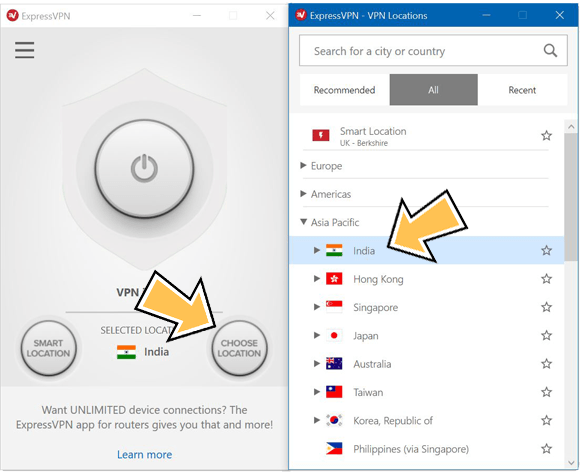 If you connect to an overseas server, a VPN can fool websites into thinking you are in a different country and so let you access services that might not otherwise be available to you. One such service is Sony LIV, the online streaming service of Indian broadcaster Sony. And it just so happens that Sony LIV will be broadcasting all of the Indian tour to Australia live and for free on their Sony LIV service. ExpressVPN was the best performer and they are also offering new subscribers a great deal too. Sign up today and you can enjoy three-months extra free on a twelve-month subscription. And with their 30-day money-back guarantee, you can try ExpressVPN out for a whole month risk-free. Click here to visit the ExpressVPN website and choose Get ExpressVPN to sign up. Then visit the Products area of their website and install the correct app for your device. Click Choose Location, then All, then Africa, Middle East & India and then select India. If the VPN doesn’t connect automatically, click Connect. Once connected, go to the Sony LIV website and enjoy. If you find the Sony LIV website won’t stream, try connecting to a different Indian server. ExpressVPN has plenty to choose from and you shouldn’t need to try more than a couple before finding one that works. India’s cricket tour to Australia begins on 21st November with the first of three T20 Internationals. These will be followed by four test matches before the series concludes with three One-Day Internationals. It promises to be a fascinating winter series down under. India are coming into it off the back off a 4-1 test series defeat against England in the summer. They deserved a bit better, but England got the best of the crucial moments and handled conditions better. Conditions will play a big part in Australia too, with the home team fearsome at times when the ball is swinging. But the Aussie test team is still recovering from the ball tampering scandal which saw Captain Steve Smith and opener David Warner banned and have been fragile of late. In their absence, the batting line-up has struggled at times, but Australia will still fancy their chances at home. And with a World Cup coming up this summer in England, the ODI’s will have extra significance at the end of the series too. If you want to watch India’s tour to Australia this winter but don’t fancy paying for a Sky subscription, we have provided an alternative. By using a VPN, you can watch all the games live and for free on Sony LIV. The best VPN to use to watch this series is ExpressVPN and we have provided an easy-to-follow guide to get everything set up. For fans of India, Australia, and cricket in general, watching this series could feel like Christmas come early!